The first galette I made was a summer squash version from none other than Smitten Kitchen. When I first found the recipe, there were a few hundred comments. I mean, hundreds of comments on one blog post is so rare--so it had to be incredible, right? It was, it really was. But I have this thing when I can't really follow a recipe from start to finish. I also have this thing when I forget to buy an ingredient for a recipe I want to make. I didn't have sour cream once so greek yogurt it was. Thus started an itch for trying variations of this tart. 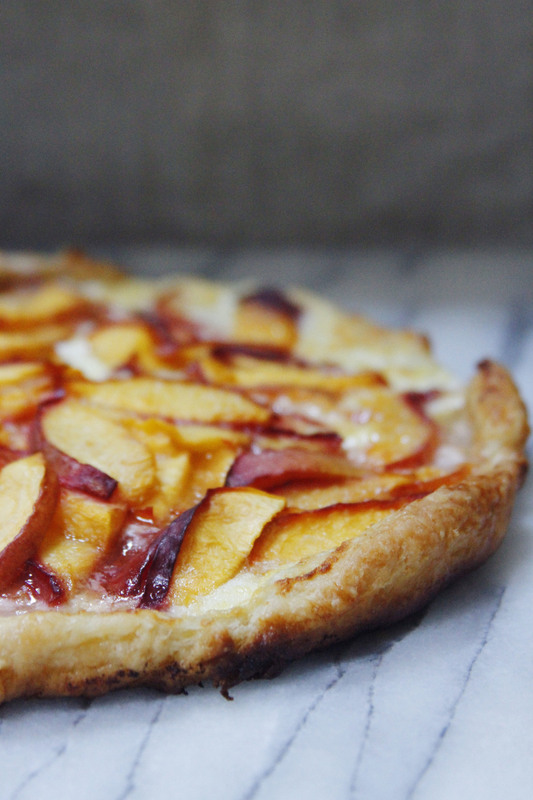 Marscpone cheese substitutes sour cream + nectarines substitute the summer squash. Summer is almost over, but I can't seem to let go of stone fruit! The fruit roasts while the tart dough turns golden brown. OK IT'S DAMN GOOD, so get on it. Start by preparing the galette dough. Combine the flour + salt in a medium-sized bowl. Add the butter to the mixture, using your fingers (the best tools) massage the butter into the flour/salt mixture. Add the marscapone, lemon juice + ice water to the bowl. Knead together until the mixture forms a soft dough. If the dough seems too dry, add more ice water. If the dough seems too wet, add more flour. Store the dough in the fridge by wrapping it up in plastic wrap. 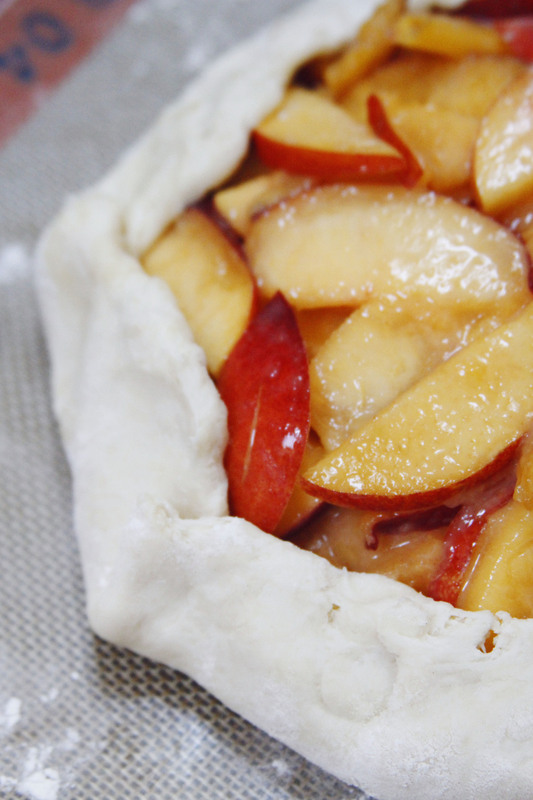 You'll want to keep the dough chilled for 30 minutes to an hour before assembling the tart. While the dough is chilling, combine the nectarines, cornstarch and lemon juice in a bowl. The cornstarch will thicken the nectarines. Allow the nectarines to sit for 10-20 minutes to thicken. In a medium bowl, combine the lemon zest + the full cup of marscapone. To assemble, roll of the dough on a parchment lined baking sheet. The galette can be any shape, but aim for a large circle. If the dough softens too much, place the baking sheet in the freezer to chill again. Layer on the marscapone/lemon zest in the center, keeping 1/2-1 inch of dough free of the mixture around the edges. Add the nectarines on top of that layer. Gently fold the edges up around the edges of the filling. Beat an egg yolk in a small dish, using a pastry brush (or honestly, your fingers) apply the egg yolk to the crust. Top the egg yolked crust with white sugar. Bake in the oven for 40 minutes until the crust is golden brown. The galette will spread out.